Coal is 10x cheaper than gasoline, for the same energy. Battery-driven autos cost much more per mile than gasoline cars, if you include the required cost of replacing the batteries after 1000 re-charges. A square mile of sunlight with current solar cells would provide as much peak power as a nuclear power plant. At $100 per barrel, the U.S. can supply all of its own oil needs for centuries to come, since coal can be converted to oil. The reason we still are importing oil is that we have not built factories to convert coal to oil; but Germany and South Africa already have. Read an Excerpt >> Energy. What are the Alternatives? Did you know that for the same energy, coal in the United States is 20 times cheaper than gasoline? This means that the real challenge for alternative energy sources is to be more economically viable than coal. This excerpt explains how the US uses fuel, what energy sources are used, and discusses the challenges facing energy alternatives. 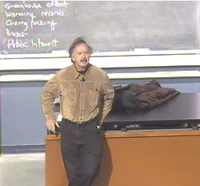 The complete list of Physics 10 lectures from UC Berkeley.